Custom builders are catching on to the fact that Passive House and net-zero energy building practices make good partners. A home that meets the standards of the Passive House Institute U.S. (PHIUS) will achieve net zero more easily and with a smaller solar photovoltaic (PV) array. One of the projects profiled in this article is a certified Passive House, while the other uses Passive House concepts to ensure indoor comfort as well as energy savings. Carl Christianson’s home in Corvallis, Ore., is the first Passive House he’s ever built. Although his company, G. Christianson Construction, has been building energy-efficient homes since the 1980s, Passive House is a new level. “I bought the company from my dad in 2014 and saw that this would be a good opportunity for us,” Christianson says of the Passive House project. Aside from the energy savings, Christianson says his new residence is extremely quiet and comfortable—not to mention useful as a marketing tool. (At press time, he was building a second Passive House for clients.) In addition to being PHIUS+ 2015 certified and earning a PHIUS Source Net Zero badge, the home is Earth Advantage Platinum certified, Energy Star version 3 certified, as well as being a U.S. Department of Energy (DOE) Zero Energy Ready Home. It achieves net zero, Christianson says, through roof-mounted solar alone. For greater efficiency, architect/builder Caleb Johnson chose materials for the Maine house that could be used for more than one purpose. 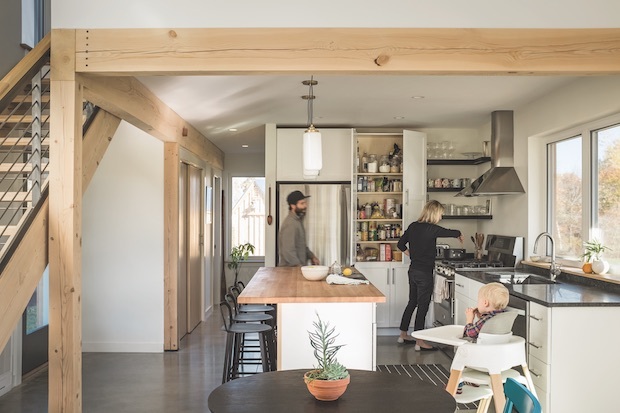 Here, unfinished wood serves as structural support, a decorative element, and visual divider between the kitchen and living room (Photos: Trent Bell). For projects like the Maine home, which was designed and constructed by Johnson’s firm, “a team of three professionals gets it done—mechanical engineer, structural engineer, and architect—as long as the mechanical engineer is experienced in passive- and active-solar design and envelope design,” Johnson says. On a piece of long-held family farmland in York, Maine, a young couple planned to build a home that would not only keep them comfortable no matter what the weather dishes out, but would also reduce if not eliminate utility bills and provide a safe, healthy environment for them and their son. Their budget maxed out at $250,000. The clients approached architect Caleb Johnson, principal of Caleb Johnson Studio, in Portland, Maine, who suggested a simple two-story form that would lower roof, foundation, and envelope costs, and a southern orientation to take advantage of passive-solar design. 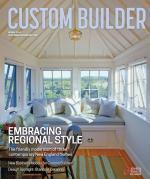 Caleb Johnson Studio’s general contracting arm, Woodhull of Maine, built the house. For energy efficiency, the house utilizes a floating slab protected from frost with thick layers of rigid foam isulation that extend from it 4 feet horizontally. While the home is not a certified Passive House, it’s pretty close, Johnson points out: “Our blower-door tests showed that it’s super airtight, and we put a heavy investment in insulation. The R-values are 52 in the roof, 26.6 in the walls, and 20 in the slab.” A post-construction blower-door test pegged the air-exchange rate at 0.74 ACH50—well beyond the recommended minimum of 0.35. The 1,100-square-foot structure features a louvered solar shade above the southwest corner windows that’s built from leftover siding and trim, adding visual texture and protecting the insulated monolithic concrete slab against summer heat gain, while allowing winter rays to penetrate deep into the space. The home is heated solely by electricity via mini-split heat pumps powered by a solar PV array. However, the clients report that even on cold winter days when the sun is shining, no artificial heating is necessary. Mechanical ventilation, required because of the tight envelope, uses a heat recovery ventilator to retain heat that would otherwise be lost to the outside. 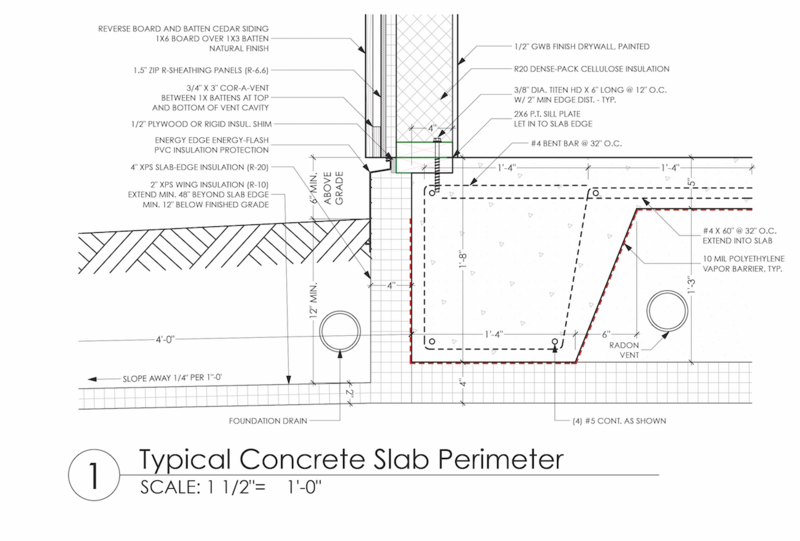 The thick, polished concrete slab that helps to regulate heat also serves as a beautiful, cost-effective finish floor for the main level, Johnson says. Locally sourced materials include hemlock posts and beams that provide affordable structural support for the second floor and a touch of natural warmth. The open-stringer stair of hemlock, oak, and steel lets light penetrate the space and air to flow freely from the heat pumps, while providing views in the main living area that enhance the sense of openness. “The stair details add richness to the home’s otherwise relatively unembellished design,” Johnson says. 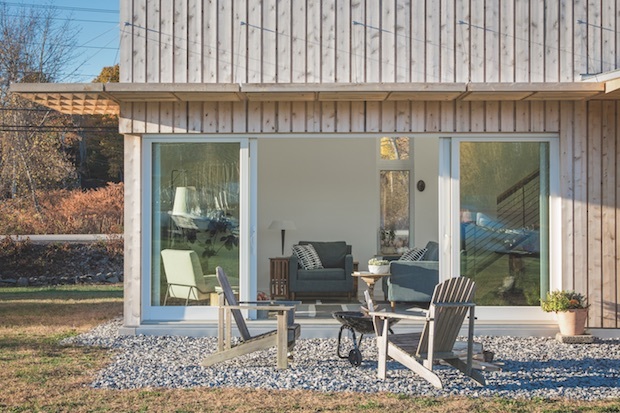 The low-slung structure of the Maine house is a simple form with no decks or railings. Low-pitched, stell-roofed canopies cover outdoor spaces and break up the simple forms. Roof overhangs, decks, and railings were eliminated to save money and to give the home’s traditional form a crisp, modern appearance. This also allowed for careful exterior sealing of roof-to-wall intersections, Johnson says. Siding and trim are made from inexpensive, long-lasting Eastern white cedar, harvested and milled in Maine and installed in a reverse board-and-batten style that allows drainage and airflow behind the boards. The framing material, also from Maine, is a mix of pine and hemlock. Exposed timbers are made of locally milled hemlock, as are the stair parts. A large window in the master bedroom was salvaged from an old New England building. The staircase ascending to the bedroom level of this 2,253-square-foot home in Corvallis, Ore., was offset to create a "reading cave" in the living room. 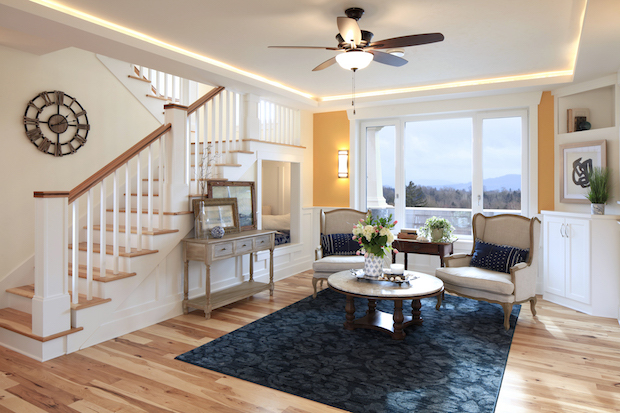 Interior finishes, including wainscotting and trim, were designed and executed by the builder, G. Christianson Construction. Design is by Studio-E Architecture (Photos: Jen G. Pywell). The new home of builder Carl Christianson and his wife, Julie, had to satisfy a host of requirements. It had to be big enough for a family of five but highly efficient in its use of space; provide for main-floor living that would allow Carl and Julie to age in place; be a certified Passive House; and act as a marketing tool for Carl’s business, G. Christianson Construction, of Corvallis, Ore. “We wanted to demonstrate the advantages of Passive House design to our community and other builders,” Christianson says. Unable to find the “perfect” plan, the couple turned to Sarah Susanka’s Not So Big House books and the cottage-style homes of Ross Chapin, an architect based in Langley, Wash. They took their ideas to the only Passive House architect they knew, Jan Fillinger of Studio-E Architecture, in Eugene, Ore.
Fillinger borrowed elements of Chapin’s designs to create a 2,253-square-foot Craftsman cottage with board-and-batten siding. It has almost a farmhouse look, he says. Also evident in Fillinger’s design are Susanka principles such as clear lines of sight, multipurpose spaces, material or ceiling-height changes to define rooms, and the incorporation of nooks and recesses. 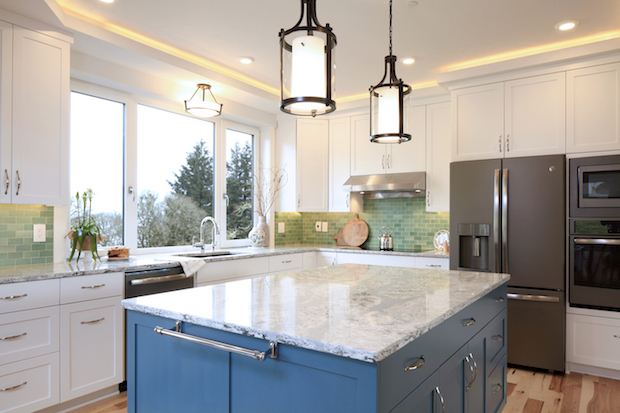 Shaker-style white painted kitchen cabinets in the Passive House built by G. Christianson Construction are paired with a blue island. Countertops are quartz. Windows are triple-pane glazed with steel-reinforced frames and sashes. Because it’s located in seismic zone D2, which may produce strong earthquakes, the home is also resilient, Christianson notes, with “quite a bit more shear paneling and hold-downs to make it stronger.” It’s positioned on the 100-by-160-foot lot to maximize views of the Cascade Mountains. To minimize the steepness of the driveway, he dug the garage into the side of the hill and built the foundation on 4-foot stem walls with a 16-inch floor system on top, which elevates the home about 2 1/2 feet above grade and slightly higher than the garage, for more street presence. A breezeway connext the home and garage. The house was raised 2½ feet above grade to give it more street presence. Specifications unique to Passive House include triple-pane windows with triple gaskets and thickly insulated walls and floors. “All of a sudden, the house becomes really quiet inside,” Christianson says. “You can’t hear cars go by unless the window is open. You don’t hear your neighbors. The thermal comfort is spectacular; we’ve got one heat pump upstairs and one downstairs rather than a central heating unit.” These, he adds, are benefits that clients don’t necessarily think about but that builders should mention. 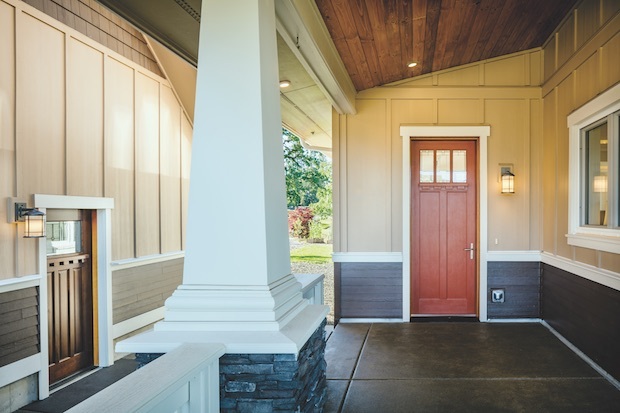 The home has a Craftsman cottage aesthetic, with its board and batten siding and welcoming front porch. Stud walls are 7¼ inches thick and enhanced with a 2-inch layer of sustainable cork insulation. The utility company’s prediction that the Christiansons would save about $1,740 per year in energy costs turned out to be accurate. Another 2 kW of solar was installed after the home was completed, due to the addition of an electric car and extra freezers for food storage. The PV system actually generates energy in excess of annual power needs. Comments on: "Getting to Net Zero"